How do you recharge this? Its about time this appeared here. =) This is an excellent pulling tool, and as a monk i have used it on very difficult situations, like for mobs that blind, charm or DeathTouch. You can get it as many times as you want as long as the Dain is up and you are at Ally faction. Just destroy it when you use the charge, and hand your 10th ring to the Dain. Youll get it back, with this. Wish the casting time was shorter but its still a practically infinite DA source, a nice little extra prize to go with the ring. Okay, at least you can get new ones. I was wondering what the whole point of putting this thing in there was, for a stupid one charge DA scroll. That would be pretty sad. I'm fairly sure that the Invulnerability spells (including Divine Aura) DON'T save you from a Death Touch - we've tried this in the past on some of the Skyplane (what we used to call Plane of Air) Boss Mobs. 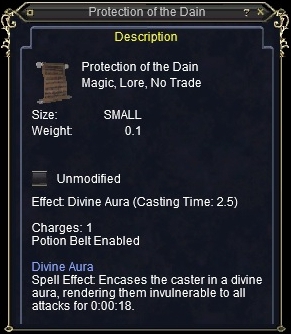 Indeed, Divine Aura line of spells (divine barrier, harmshield) do not protect from death touch. Will protect from harm touches though, and mobs will aggro on you while DA. Providing they will aggro on you without you having to do anything (ie. kos mobs). Side note though, spellshield line of spells. The ones that are runes vs spell damage will protect against death touch, just no way to get 20k worth of them on though. Divine Aura does not protect from old world plains death touches. It does protect from luclin death touches, and maybe some other expansions. Don't know about the entire expansion, but I know DA does NOT protect you from DT in Sol Ro's tower, a friend of mine was playing his Necromancer and decided to try to get to see something or other, so he hit Quivering Veil of Xarn and ran in, 20k hit like a hot knife through soft butter.